A hypermedia ecommerce API isn’t like other APIs. Elastic Path Cortex completely decouples client applications from business platforms, yet enhances their ability to securely retrieve data and perform transactions through our hypermedia API. This breakthrough API technology gives you unprecedented freedom to create unique digital experiences. Ecommerce APIs from other vendors are less sophisticated and come with significant overhead. Here are 10 ways that a hypermedia e-commerce API changes everything. To make your job even easier, Elastic Path Cortex comes with great developer tools to foster agility, creativity, and productivity. These include Cortex Studio, an interactive ecommerce REST API development environment; Graph, a utility that generates live, visual representations your resource relationships; Health Monitor, an API performance dashboard, and additional utilities to help you create and manage resource schemas. Elastic Path Cortex offers complete role- and resource-based access control with user authentication, roles, and permissions. Securing multiple business platforms with our commerce API mediation allows you to offer API consumers one hardened point of entry with a single set of authorizations to manage, instead of widely distributing security across separate enterprise applications. Cortex provides additional hypermedia controls that extend the functionality and usability of Cortex far beyond Level 3 REST. 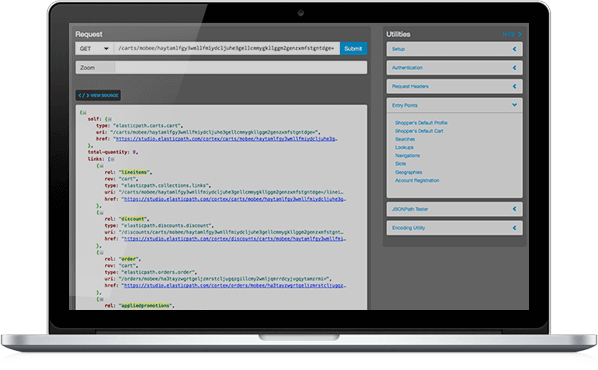 These include built-in forms and selectors to drive UI-like state changes directly from the API, workflow controls that reduce the need for business logic within clients, and a robust resource zoom feature that gives developers complete control over denormalization, drastically reducing both the size and frequency of API calls. Cortex was designed so that our customers — from mobile operators to Internet Retailer® Top 500 stores — could drive some of the world’s most demanding applications. In the vast majority of installations, the performance limiting factor will not be resource mediation, but the response time of your underlying systems, because the throughput of Cortex running on just a handful of nodes far exceeds that of most business platforms. Because Cortex mediates API requests and responses before they are routed to separate platforms, it’s perfectly situated to collect the aggregate engagement and transaction data needed to generate one view of the customer as they shift between digital experiences. Collecting data below this level results in a fragmented profile as each platform provides only a partial, application-centric view of each customer. Installing a data tap above this layer, at the API management level, generates raw data that lacks the semantic order that Cortex provides because of its intrinsic knowledge of your resource relationships. The valuable Cortex data can be fed to MDM platforms, business intelligence applications, or even next-best-action systems to facilitate real-time, automated marketing. Elastic Path Cortex is a revolutionary way to let the best-of-breed applications in your ecosystem work together to create new, innovative services that generate real value from your IT portfolio. Its patented dynamic linking technology allows you to configure how resources from these platforms are assembled at runtime to form secure, easy-to-consume Cortex Business APIs that precisely reflect the use cases of your API consumers, not those of your backend systems. Data integration and federation happen automatically in the Cortex mediation tier, reducing the need for batch ETL, data replication, and other inefficient forms of integration. Think of it as an enterprise-grade mashup engine that finally allows you to unleash the potential of the business logic and data trapped inside your business platforms. The Cortex microkernel is based on the OSGi™ framework, which provides secure resource isolation, library segregation, and a nonstop lifecycle. By conforming rigorously to the HATEOAS constraint and Level 3 of the Richardson Maturity Model, Cortex delivers your services and capabilities in a stable, versionless form that is unaffected by changes to the underlying application portfolio. Transactions are conducted using simple, human-readable resource identifiers and hypermedia controls that are coupled loosely to your enterprise systems via a lightweight schema and efficient tooling. This complete separation virtually guarantees the continuity of services even when the business platforms change. Give business teams the freedom to unleash their creativity with minimal IT intervention. With access to unified services via Cortex, these groups can build and manage digital experiences like websites, apps, social selling, and embedded commerce, on their own. Cortex eliminates the need for designers and developers to have any knowledge of your back-end systems in order to integrate effectively with them, so projects can be staffed with any combination of internal resources, partners, agencies, or freelancers. In the language of the Gartner® Pace-Layered Application Strategy™, Cortex mediation is the ultimate connective tissue between your systems of record, differentiation, and innovation. 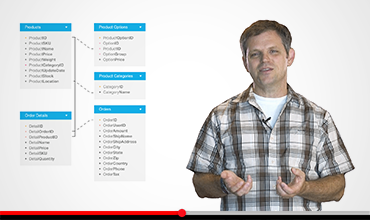 Matt Bishop, principal architect at Elastic Path, explains why the company chose a hypermedia API style for its commerce software. We believe in empowering developers with the latest ecommerce framework and API-driven technologies, enabling you to be a hero to your users.